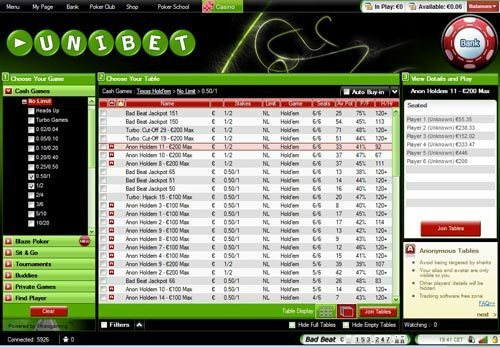 Unibet made some waves in the online poker industry by developing its own software platform early in 2014. If you’re looking for a unique playing experience designed with fun in mind, then be sure to download the Unibet poker client by following FTR’s links. You’ll automatically start earning your bonus upon logging into the software without the need to enter any codes or click anything. 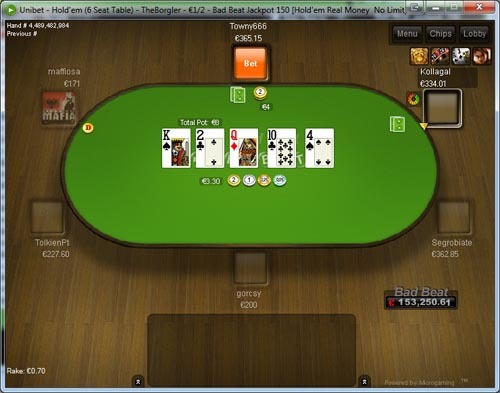 There’s no need to worry about confusing points accumulation schedules when you work towards your Unibet welcome bonus. As soon as you hit the applicable rake targets, you’ll be issued the corresponding payment to your account. Play as much as you can within 60 days to receive up to €500 for free! If you manage to rake €2,000, the entire €500 will be yours! While the rate as which you earn the bonus changes depending on what level you’re working towards (see above), you’ll achieve a cashback rate of 25% if you manage to earn the whole €500 bonus. You can successfully complete the bonus terms by playing 1,000 €20 + €2 tournaments or playing fewer than 50,000 hands of 50NL 6-max. Take a glance at the bonus clearing information on the right-hand side of this page to see how long bonus earning will take at different games and stakes. The information in the chart is listed in dollars, but it’s really applicable to the games denominated in euros at Unibet. The “VIP Program” at Unibet is completely different from anything we here at FTR have ever seen before. You’ll earn 100 loyalty points for every €1 in tourney fees you pay, which is the only normal part of Unibet’s Challenges system. In cash game play, you’ll earn loyalty points by completing Challenges. At any given time, you’ll have one major and one minor Challenge to work towards. These are determined randomly, and they are each associated with a stated number of loyalty points that you’ll receive upon completion. The higher the stakes you play while attempting the challenge, the more points you’ll get. When you’re done with a given challenge, you’ll receive another one. The challenges often involve performing certain actions at the tables, like winning a specific number of hands preflop or going to showdown 10 times with a given rank of hand. Every three months, the challenges reset, to be replaced by new ones. You can also discard a challenge that you don’t like once per month and receive another one in its place. As you pass certain loyalty points thresholds, you’ll receive a corresponding reward. The rewards include custom avatars, MTT tickets, cash bonuses and live tourney packages. While it’s impossible to accurately calculate the value of this system at the cash tables, tournament play seems to offer rewards equal to around 20% – 30% rakeback. Check out the uncommon features, gameplay and rewards on offer at Unibet Poker by clicking on our links below. The sooner you join up, the sooner you can begin to earn your €500 bonus!